As all of you probably already know, we are organizing the first OpenSimulator Community Conference on the first full weekend of September, 7-8. This event has been in the making since, roughly, March. But it took us a couple of years before that to actually convince ourselves that it was worth doing it. Here are all the reasons why I think this event a great thing, and why everyone who uses OpenSimulator should be involved in some way. When we started planning this in March and we faced the prospect of a 200 people event, we went “omg!” Although we had never even tried, we knew that we could not host a 200 people event with OpenSimulator as it was in March — period. The maximum number of people we had ever attempted was 52, and in that test, lag started lurking in at 20, and never went away;we hit 52 people, but no one could move and chat was laggy as hell; the simulator eventually crashed. That test was back in 2009, too, a long time ago. Apart from Intel and its Distributed Scene Graph work, which takes a drastically different architectural approach, none of us has ever paid much attention to core simulator performance. It was clear that if we were going to attempt a 200 people event, we would need to invest a lot of our time in making OpenSimulator perform not just as well as the Second Life simulators, but… better. A sim with 10 people standing around and chatting, which is a typical scenario for these virtual environments, now uses as little as 15% CPU — you can practically hear it yawn! Just to name three: the Hypergrid, teleports in general and Groups. In chasing bugs, we realized that what we were doing with teleports was not exactly in accordance to what the viewer was expecting. So we completely rewrote the Teleport protocol. The new protocol conforms with what the Linden grid does, as far as we can tell. As a consequence, teleports are now more solid than they ever were. As for Groups (V2), even though I added this to OpenSimulator back in February, it had never been tested at scale. In using groups in the Conference Center grid, it was clear that there were some major issues in there that had been inherited from the Flotsam groups implementation. One of the major ones was in Group chat, which was very laggy and.. well, wrong. Group chat is now fixed. In the last load test we had 100+ people chatting (abusing) over the Load Test group with no additional CPU usage, no duplicate messages and generally no noticeable bugs. We also plan to make heavy use of groups for access control and permissions. Our smaller tests indicate that this can now be safely done. This has, perhaps, been the best surprise of the process: we have had an increasing synergy with some of the viewer developers, specifically Singularity. So much so that we are planning to release a version of Singularity that is branded for the conference event. Some of the Singularity developers have been part of the load tests, and they have been extremely responsive to information and change requests that make the whole system work better. For example, thanks to lkalif, I was able to make the edit beams work in OpenSim (have you ever noticed that in OpenSim the edit beams were gone?). Another example, because of the new way that the viewers handle the map tiles, the map was useless after an Hypergrid Teleport; thanks also to lkalif, this has now been fixed in Singularity! Q: how would sponsors bring their content to the Conference Center grid, especially those whose grids aren’t Hypergrid-enabled? A: add a feature to Wifi that allows users to upload IARs. Done. It will be part of the next release of Wifi. The OpenSimulator core developers are a bunch of radically independent nerds that have shown more talent to code than to do community management. That’s an unalterable fact. Luckily for this conference, we’ve engaged with AvaCon, a non-profit whose sole purpose is to help foster communities in the Metaverse. It’s been great to see the volunteers and presentation proposals coming in, managed by them! Now that I see it, I can’t wait to hear what people have been doing with OpenSim! I don’t think I ever attended a virtual conference like this before, so this is a first! If we are really able to pull this off in September, we might see more conferences going virtual instead of contributing to waste the ozone layer! We are still in need of inworld volunteers. Consider volunteering to help during the conference. You’ll get an inworld ticket, and those are limited! Don’t have much time to volunteer or cannot attend the conference? Consider being a sponsor, even if at the lowest level (US$50). 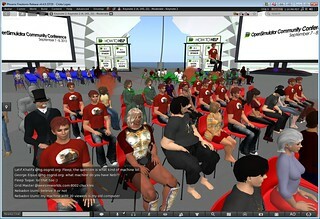 While a virtual conference is 80x cheaper than a RL world one, it is not free of costs entirely. These sponsorships help defray the costs that we are incurring in. Come participate in the load tests. We have one every Tuesday at noon PST. There is also a special load test this Saturday, where we hope to get close to 200 avatars — the real deal. Be part of a major milestone in the history of OpenSim/Second Life. Published by Diva Canto, in OpenSim. Tagged with oscc, virtual conference.